Red Bull is inviting Chicago’s best streetballers and challenging them to put their skills to the test in the one-day Red Bull Reign tournament. Taking place at Chicago’s Seward Park on July 26, 2014, the unique three-on-three basketball tournament will pit hoop hopefuls against one-another in a high-endurance, offensive-driven battle. The winning team will receive a once-in-a-lifetime basketball experience courtesy of Red Bull in Las Vegas in addition to qualification for the FIBA 3×3 World Tour Masters in Chicago this August, where the winning team advances to the World Tour Final in Tokyo, Japan. The rules of the high-flying tournament are simple. The teams that score the most overall points in the first round will advance and play again later in the day. 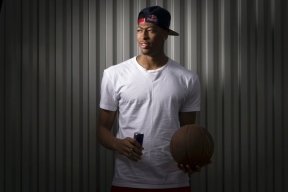 Open to players 18-and-over, the Red Bull Reign competition will be hosted by Red Bull athlete and Chicago’s very own Anthony Davis, who will also present the Championship team with its prize at the end of the day. The competition tips off at 10 a.m. and continues until 7:30 p.m., when a thrilling Slam Dunk Contest will be preceded by the Red Bull Reign Championship game on the Main Court. Seward Park is located in the Near North Community Area of Chicago and spans more than seven acres as a place for basketball lovers and all types of active individuals to train for greatness. The competition is open to the public and free of admission. More information can be found at RedBull.com/Reign.